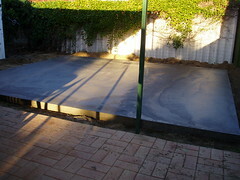 Nearly four months after we signed the contract for the studio, I am now the proud owner of............a concete slab! Firstly, the local government authority took three months to approve the building permit then the company who are building the studio "lost" our folder of specifications and plans until I finally took a day of work and went into their office. I merely asked why, after nearly four months, do I not have a studio in my back yard??? Well, from 8.30am until 1pm, there was mad search for the folder which was finally located and within four days, I have a slab, but at least I can plan where things are going to go and best of all, I'll have my OWN place to sew, to cut, to pin and to dream.........this photo shows how the studio will be flush up against the brick paving and roof of the patio area. Men at work - on my studio.